Sciatica - Or Something Else? Do you have low back pain that radiates behind the glute and down the back of the leg? This may seem like an oddly-specific question, but these are actually the symptoms of an extremely commonly diagnosed issue called sciatica. Actually, to be more accurate, I should say commonly misdiagnosed issue. Let’s get into it. Sciatica, as I mentioned before, causes people to experience pain or numbness in the low back that often radiates down the back of the hip and leg. This happens when a herniated disc in the lumbar spine compresses the sciatic nerve. The sciatic nerve is a very large nerve originating from the lumbar spine innervating the hip and leg. As such, a bulging or herniated disc can easily impinge the nerve, which sends pain and discomfort along the nerve’s route. Sciatica is a serious issue and individuals suffering from it often go through extensive physical therapy, use medication for inflammation and pain management, and in some cases even undergo surgery. However, a huge issue, as I alluded to before, is the misdiagnosis of individuals with similar or identical symptoms who do not actually have sciatica. So how it is that some people with similar or even identical symptoms may have an issue that isn’t sciatica? Let’s talk about another issue called piriformis syndrome. Piriformis syndrome is a condition in which the piriformis muscle, a deep hip stabilizer and external rotator, spasms and causes pain. 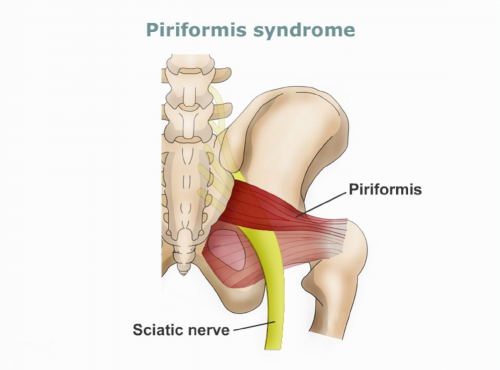 The piriformis may also irritate the sciatic nerve which runs through its fibers to cause pain, numbness, and tingling that runs from the glute down the back of the leg. This should sound familiar - the symptoms are nearly identical to those of sciatica. The bigger problem is that these issues - pain, numbness, and tingling radiating down a limb - are not just sciatica or piriformis syndrome symptoms, but symptoms that could arise from a nerve entrapment anywhere in the body. When nerves get compressed by muscle spasms, tightness, or a bulge from a herniated disc, they become irritated - and may cause some or all of the suffering we’ve discussed. Identifying the true issue is extremely important because that will determine what the appropriate treatment is to bring someone out of their pain and suffering. If someone has piriformis syndrome or nerve entrapment because of tight muscles, a skilled bodyworker can work to relieve tightness and very quickly do away with someone’s pain and issues. However, if someone has true sciatica - a bulging lumbar disc impinging the nerve - more serious action needs to be taken to address and solve the problem. If you’re suffering with pain similar to what I’ve described, be sure to seek multiple opinions and get an MRI or X-RAY to see what’s actually happening with bones, discs, muscles, and connective tissue. If you aren’t 100% sure about the cause of the issue, start with a less aggressive, non-invasive route before considering more serious options like medication and surgery.